"Eko Solar" company headquartered in Belgrade, is a private company founded in September 1992. "Eko Solar" is the first registered manufacturer of "Colloidal Silver Water" in Serbia, which meets all legal requirements. Superior American technology, fully automated production and regular quality control of the Institute of Preventive Medicine, Military Medical Academy in Belgrade guarantee high quality and complete safety of this product. 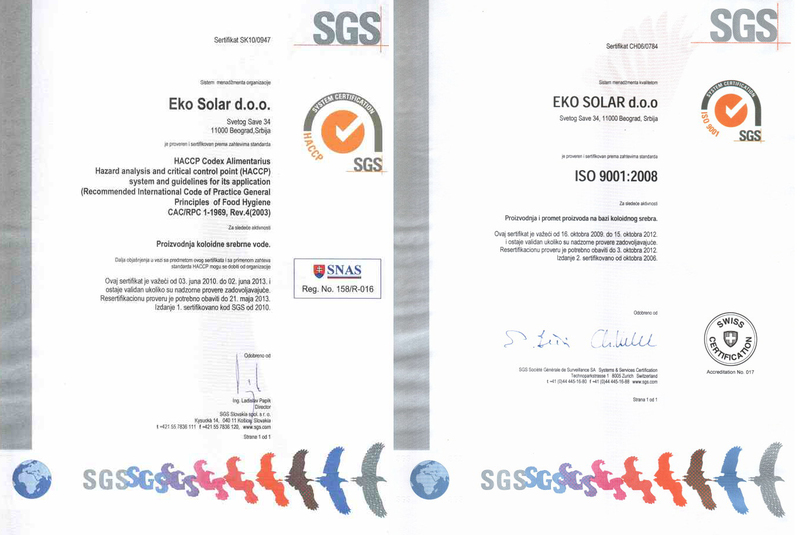 The company "Eko Solar" owns certificates renowned Swiss firm SGS to meet HACCP and ISO 9001-2008 in the production and sale of products "Colloidal Silver Water".